Here is my latest little find…Agave Nectar. It’s a nice natural sweetener to add to your repertoire. Compared to honey it is not as thick and is more mild in flavor, which I like for some purposes. The gycemic load and gycemic index of agave nectar are lower, which is good for those with diabetes. But let’s talk health claims for a moment. 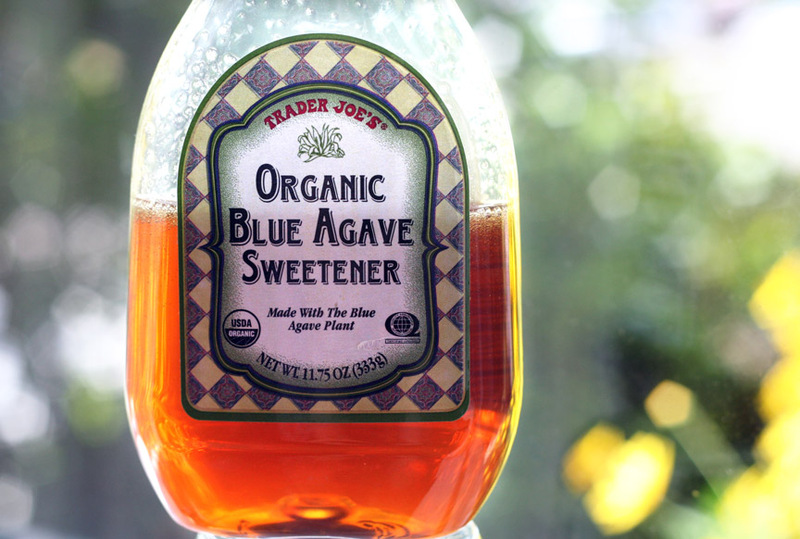 Agave nectar is not necessarily healthier than other sugars. I actually bought it initially because I heard it was better for you (not good for you, just not as bad). Well, it’s about as healthy as sugar. Or even high-fructose corn syrup, for that matter (HFCS and agave nectar have very similar composition). I suppose the lower glycemic index and gylcemic load is a good thing, but high levels of fructose, which agave nectar has, is not so great for you. It all ends up coming out in the wash. But I still like it. It’s a nice alternative to have in the cupboard. We’ve enjoyed using it to sweeten oatmeal (it’s much cheaper than pure maple syrup) and yogurt, and Cate likes it on her toast! The morning buns I had at the Berkeley Bowl were from Semifreddi’s bakery, which has 3 locations in the Bay Area…none of which are close to where we live. But I just discovered our Trader Joe’s carries some of their products. Yippee! This cinnamon twist bread made for some mighty delicious french toast. Oh man, I just can’t resist quality baked goods. It’s a problem. I’m planning on making lots of salads as side dishes this week…I think I’ll pick up some of that spring mix salad from Costco. Love that stuff! I love it every spring when the daffodils hit the shelves at my local grocery store (Safeway, Trader Joe’s…take your pick). They are CHEAP, so I don’t feel guilty buying bunches of fresh flowers for no reason. And they make me happy. This year was no exception. I grabbed a few bundles, had the checker bag them for me and carried them separately and safely in the front of the car. Then promptly forgot about them! THREE days later I spotted them on the floor of the car…and, believe it or not, they survived! 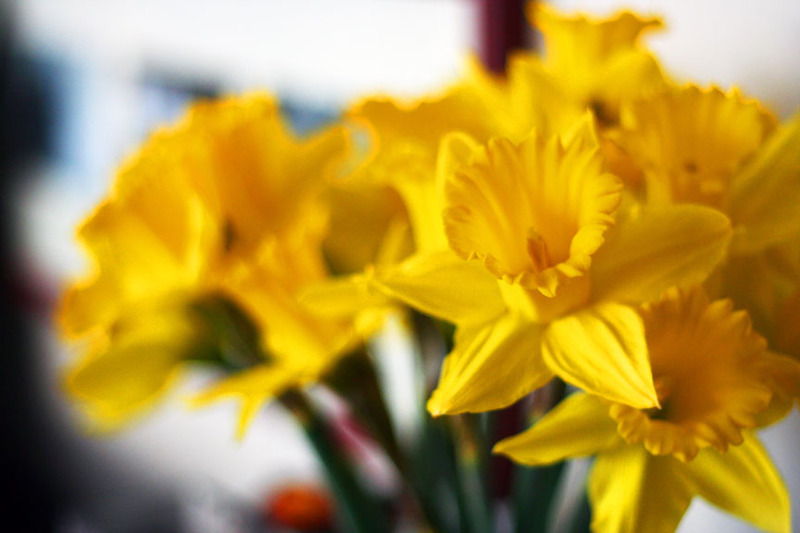 Yes, they may have been a little more “crisp” looking had they seen water earlier, but seriously…Go Daffodils! Those are some resilient flowers! Today’s post is a doozie. Get ready. So many good things to share from one simple dinner! 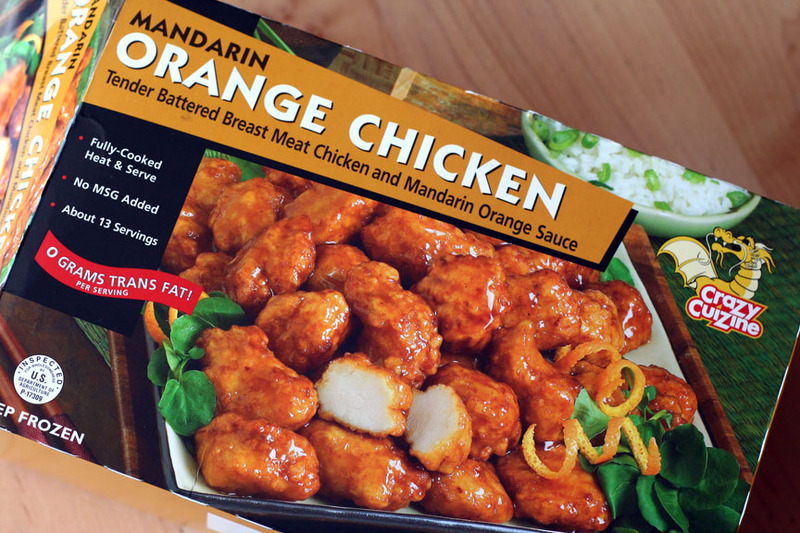 #1: Mandarain Orange Chicken in the Costco freezer section is back! 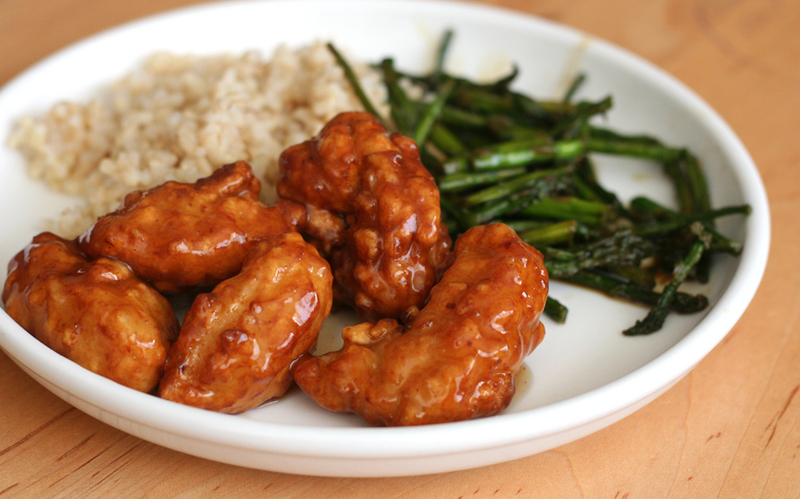 About a year ago, I wrote about how I love the Mandarain Orange Chicken from Costco’s freezer section…even more than Trader Joe’s (sorry, Joe!). Then I kept getting comments on the post asking if I knew the brand, people couldn’t find it and, horror of horrors, a Costco rep said they had removed it from inventory. It was a sad time. I went to Costco last week…look what I found tucked in the freezer? Yippee! The brand is Crazy Cuisine, in case they discontinue it again and people need to track it down. It was as yummy as ever. Last week I asked for tips on how to make brown rice like PF Changs. Quick update: I found short grain brown rice in the bulk section at our grocery store. It wasn’t exactly like PF Chang’s, but it was what I was looking for (I’m pretty sure PF Chang’s is, in fact, using short grain brown rice, just a different variety). The short grain brown is stickier, making it perfect for Chinese food. 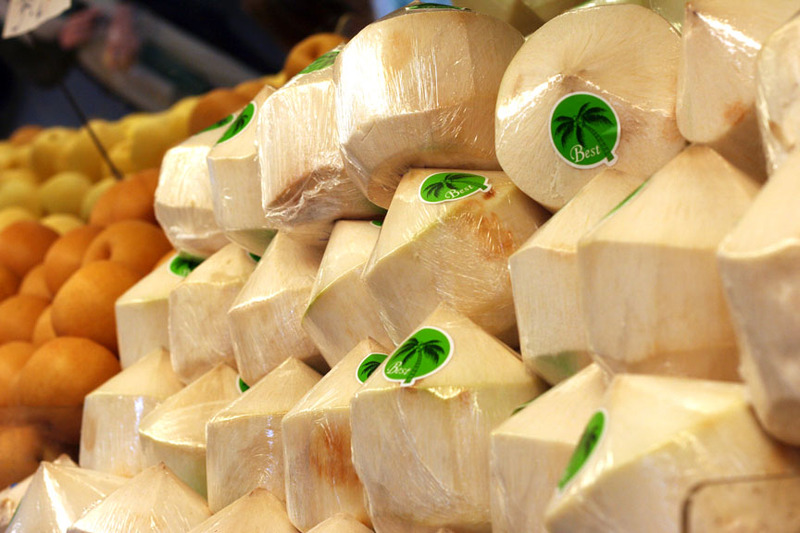 It is definitely good enough to be the healthy replacement for my all-time favorite Calrose rice. When I went to Berkeley Bowl, I bought a few million pencil asparagus (I love skinny asparagus!). Of course we couldn’t eat it all at one sitting. While I love freshly cooked asparagus, leftover cooked asparagus? Not so much. But I have discovered a good use for this soggy leftover! I chopped the asparagus into smaller pieces, sauteed over medium heat with soy sauce, a dash of sesame oil, ginger, garlic, salt, pepper, and a spoonful of sugar (you know, to help with the medicine). It was DEEEE-LISH and the perfect side dish for Chinese food. Very simple and easy. You know what to do…please post your menu for the week! 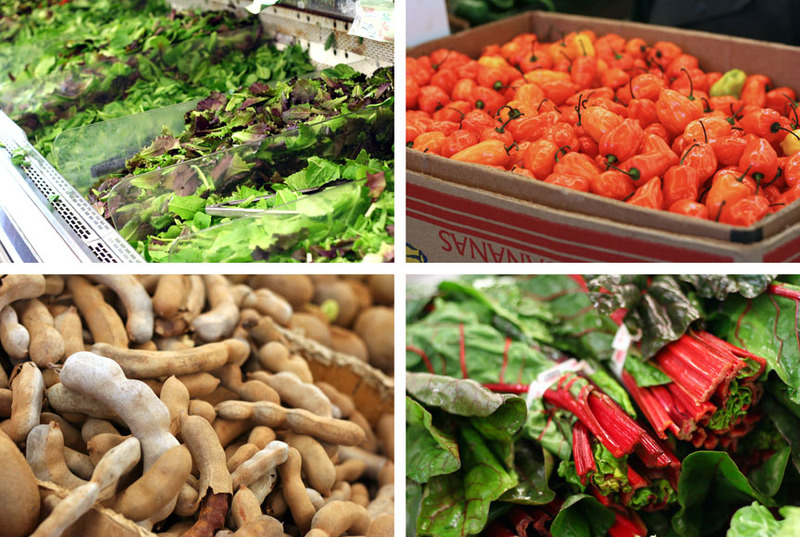 Last Friday my friend Melissa and I took a field trip to Berkeley Bowl Marketplace in Berkeley. 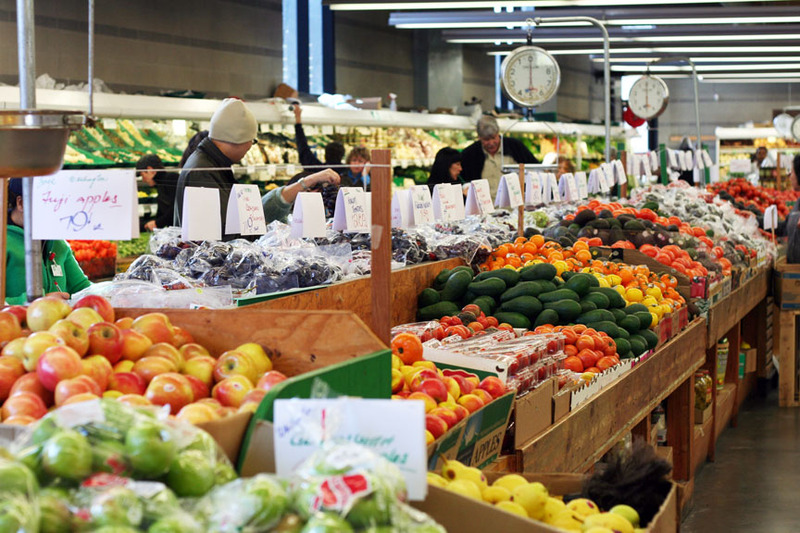 If you haven’t heard of the Berkeley Bowl, it is an independent supermarket known for its amazing produce section (some say the best in the country). To really give you the flavor of the place, PLEASE go read this article in the LA Times. It’s great. I promise you will be entertained. And check out this follow-up blog post by the author of the article. Awesome. Of course, after reading THAT I had to go. Plus my friend from Berkeley said the place rocks. Melissa and I took our girls and had a blast browsing for well over an hour…and we didn’t even make it down the aisles. The perimeter of the store kept us plenty busy! I came home with many delectable treats. A Friday morning well spent, to be sure! And now, for the barrage of pictures! One of the first things we saw was this olive bar, which was about twice as the big as the picture indicates. 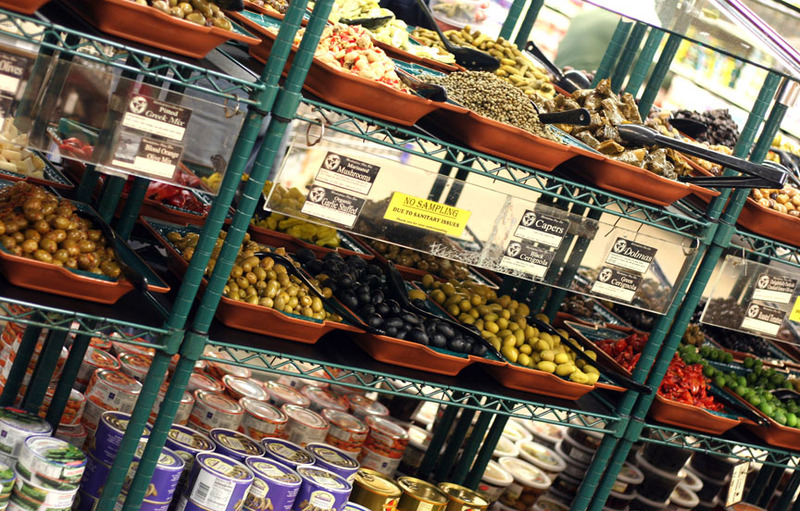 The whole store was great, but seriously, the produce section was OFF. THE. HOOK. I didn’t even know what half the stuff was. Like this Mexican chayote. Anyone? I didn’t buy one, and not just because I didn’t know what to do with it. 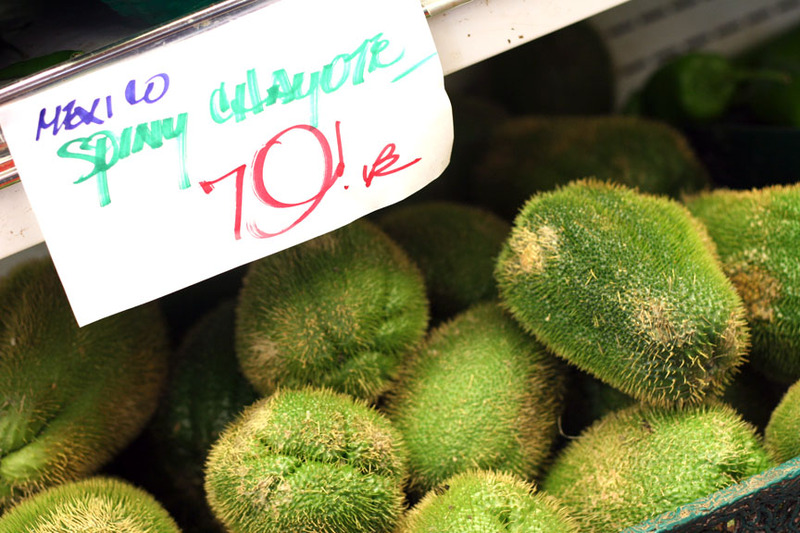 Yeah, touching a chayote is what I imagine being attacked by a few dozen porcupines must feel like. The best part was the amazing variety. So many different kinds of every fruit and veggie. 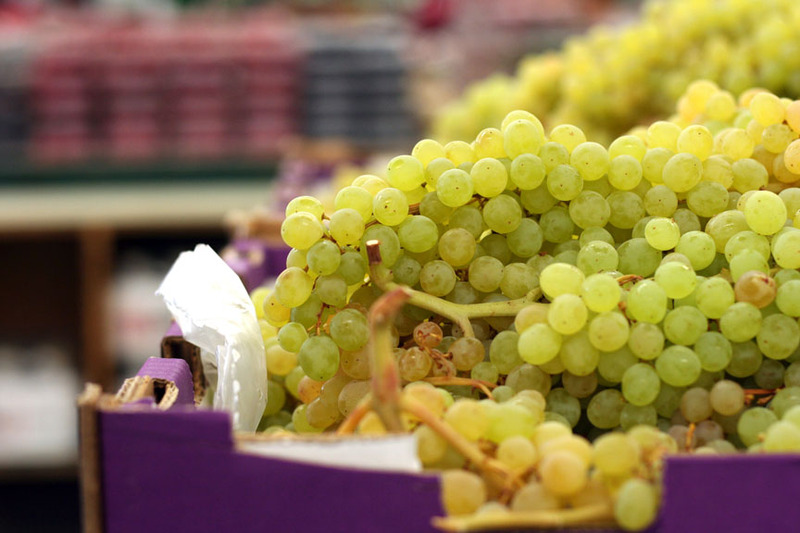 These grapes were TINY. And so sweet. 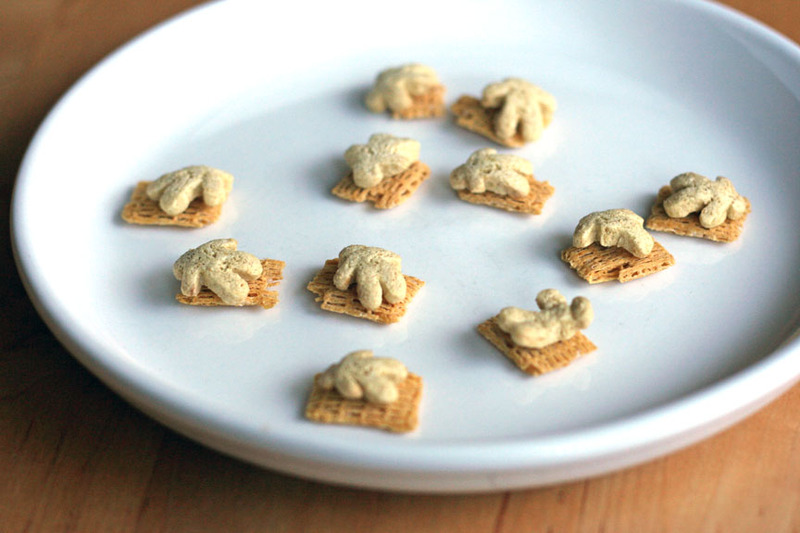 I bought them simply because they were cute, and thankfully they tasted good too. 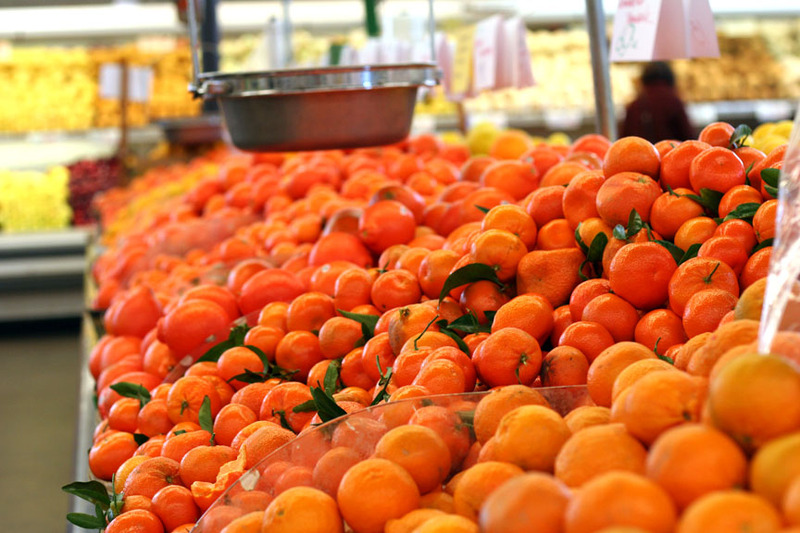 Everywhere I turned I saw beautiful produce. A feast for the eyes as well as the belly! On the way out we grabbed some ‘morning rolls,’ which looked like they might be a bit dry. Au contraire. They were moist, buttery, little bits of heaven. As we ate them, the bakery truck that brought them to the Bowl drove by. Sponge or Rag? Sponge, of COURSE. I grew up in a dishrag family. Then I married someone who preferred sponges. I was grossed out at first, but I gave it a try…now I’m hooked. 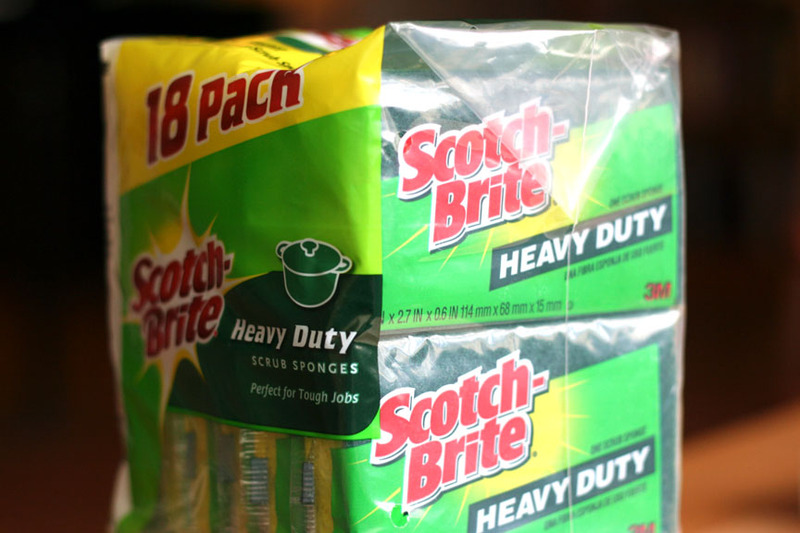 To Scotch-Brite Heavy Duty sponges, to be exact. And dishrags gross me out. Rarely does my happy food blog inspire controversery…but I do like to shake it up every once in a while. Are you a sponge person or do you prefer to use those floppy, yucky dishrags? Put up your dukes! It’s time to defend to the death! 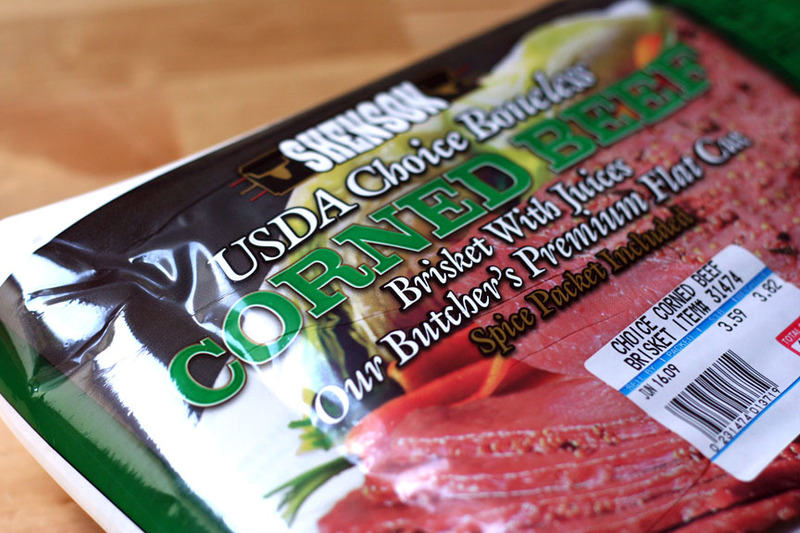 Happy St. Patrick’s Day…have some corned beef! Happy St Patrick’s Day! I had visions of turning all of our food green today, but Cate wouldn’t have it. When I offered green pancakes or oatmeal this morning she replied, “I had green eggs and ham at school and it wasn’t good. No thanks!” So much for being a fun mom. I promised corned beef recipes, so here we go! Delicious corned-beef hoagies with melted cheese! Rinse meat under cold water. Place in large pot – cover with 6 in cold water. Cover pot – bring water to boil. Pour off water. Put 6 in cold water back in pot. Bring to boil covered. Repeat if want less salty taste. Skim off scum. Add spices (p.s. I always forget to buy juniper berries, but the little spice packet that comes with the meat seems to be enough) . Lower heat, cover and simmer til very tender but still holds together, ~1 hour per pound. From my mom-in-law Pat”¦who is a McCarthy, so I would trust her with an Irish recipe. She says this is a yummy way to get corned beef down the throats of the non-Irish. Cover the briskets with water and boil, then simmer for 3 or 4 hours. Take outta the water and save water to cook your cabbage, carrots and potatoes in. Heat oven to 425 or 450. Put brisket on a broiler pan. Mix above ingredients so they hold together as a glaze. (Add OJ last to see if too watery – and sorry there are no measurements!) Put glaze on top and baste again every 20 minutes or so. Then reduce oven to 325. Glaze some more, every 25 minutes or so, till the fat drains through the broiler pan. Total bake time is about 1-1/2 to 2 hours – a big commitment – but yummy. I may be opening a can of worms with this Kitchen Tip. So I need to explain myself fully. 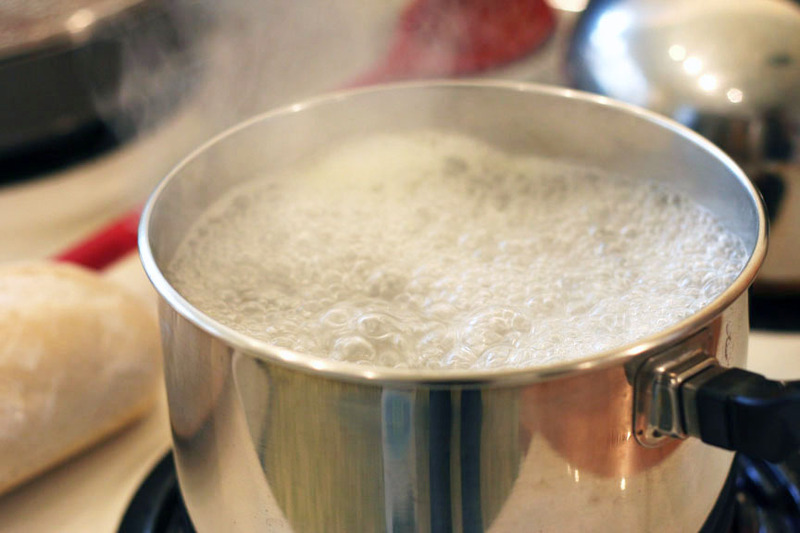 When Nate’s mom, Pat, was in town, we were cooking pasta and my pot kept foaming up and boiling over. She said, “If you put a little oil in the water, it won’t do that.” So, this past weekend, I gave that little tip a try and it worked like a CHARM. Now, you may be thinking to yourself, I remember someone telling me you shouldn’t put oil in the water, that it doesn’t do anything, that the pasta will get slimy, etc, etc. Here’s the deal. Many think putting oil in the water will keep the pasta from sticking together. This, in fact, is NOT true. Oil in the water has no impact on the stickiness of the pasta. The best thing to do for that problem is to stir the vigorously-boiling pasta a few times, especially near the start of cooking. And throw a dab of butter or olive oil on the pasta after it is drained. Although, the experts may say that your sauce will not adhere to the pasta as well. Whatever. Doesn’t seem to matter to me. Which brings me to my next point. Putting oil in the water will not make your pasta slimy. I put about 1/2 teaspoon of oil in the water. It kept the water from foaming and overflowing…and my pasta was not slimy in the least. The oil all goes to the surface of the water, so it really doesn’t have much interaction with the pasta. Bottom line…I love this new trick. I’m going to add a bit of olive oil to my pasta water from now on. Thanks, Pat! 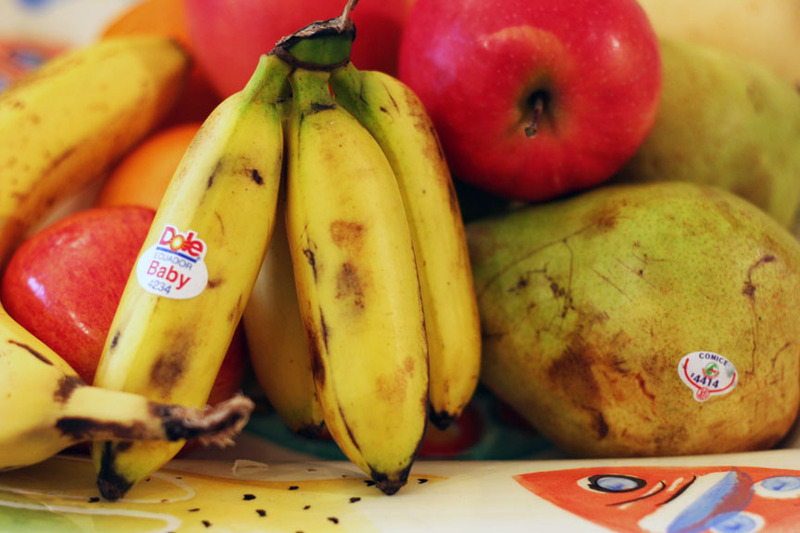 How cute are these bananas? 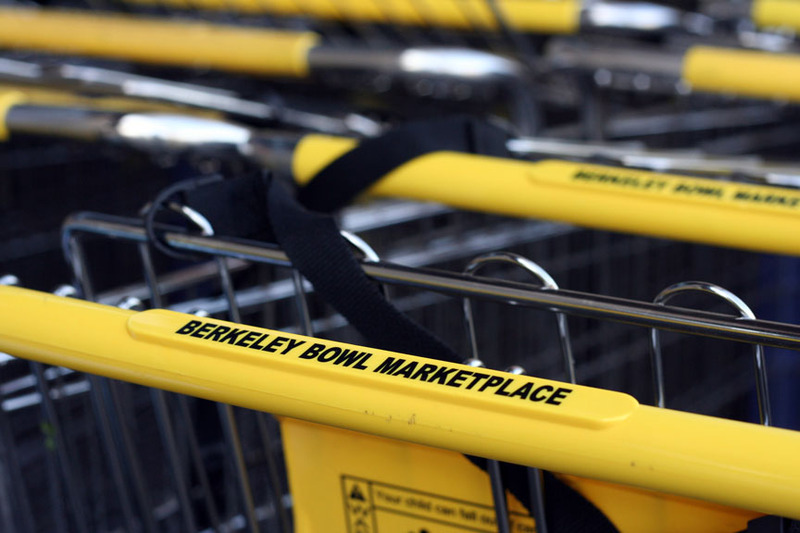 I took a trip to the Berkeley Bowl on Friday (oh, the pictures I have to share with you! coming soon…) and could not resist buying these bananas. We’ve yet to eat them. They’re too cute. I was an International Relations major in college. I remember discussing a banana stalemate between the Germans and the French. One country liked big bananas, the other small. Believe it or not the issue caused problems in the European Union. I’m a mom now, so the details have since been fried in my brain. 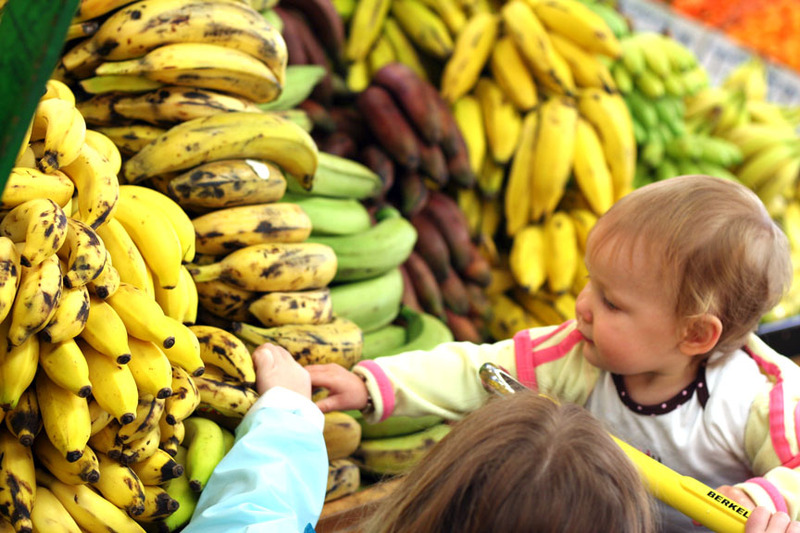 But for some reason buying little bananas was fun. I felt like I was rebelling against the French…no wait, the Germans. No, the French. Wait…who knows?!?! – Happy St. Patrick’s Day! We’ll be having corned beef sandwiches and all things green! I’ll share instructions for cooking corned beef on Tuesday! – Brown rice…does anyone know what kind of brown rice I should buy that is like what they serve at PF Chang’s? The brown rice I have comes out differently, so I know I need another variety. Okay, bring the menus ON!